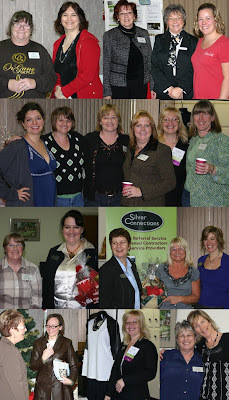 Thank you ladies for another amazing meeting/ Christmas bazaar and tradeshow, the energy was fantastic! It was wonderful to see all of the products and services that our members offer! If you didn't get a chance to follow up with someone and need their contact information just let me know and I will do my best to connect you. Through the $5 donation for the tables along with the 50/50 we are able to donate a total of $175 to a local charity. Last year we donated to Kawartha Lakes Food Source. This year I would like to donate the $175 to the Santa Claus Stocking Fund. Last year, through the Stocking Fund 823 children in the Kawartha Lakes area were able to enjoy a happy Christmas. Over 98% of donations directly benefit the children of our community. The Stocking Fund has great support from the local newspapers, businesses, BobFm and .... the ladies of WiN. Thank you! Thank you too for your donations of non-perishable food items. Well December is fast approaching and our Dec. 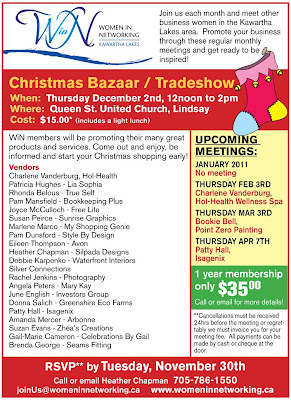 WiN meeting and Christmas Tradeshow/Bazaar is next Thursday, Dec. 2nd. If you are not on the list as a vendor please let me know if you will be attending. Full details attached. This is a great meeting to introduce friends and colleagues to the WiN group, pass along the attached flyer and bring a guest or two! The Dec. meeting fee is $15 for both members and guests which includes a light lunch. Please bring along a small door prize if you can and if you are able a non-perishable food item would be wonderful too as I will be making a trip to the food bank after the meeting. I look forward to seeing everyone next Thursday! 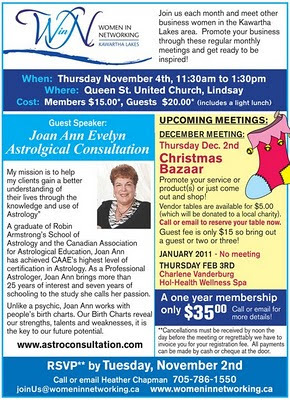 It's that time again... our next meeting is Thursday, November 4th and our guest speaker is Joan Ann Evelyn of Astrological Consultations. Full details below. Our October WiN meeting is Thursday, October 7th. 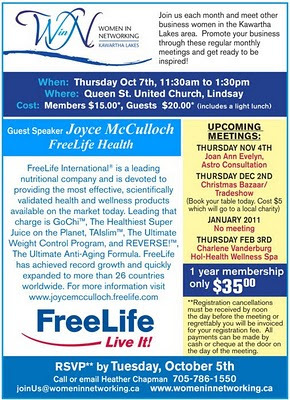 Joyce McCulloch of FreeLife will be our guest speaker - full details below. Please let me know if you will be attending. If you are interested in having a table at the Christmas Bazaar/Tradeshow please let me know. The cost is $5 which will be donated to a local charity. Also, remember to bring in your empty wine bottles for JobsRUs, they provide a wonderful service and support to those with intellectual challenges and their families within the Kawartha Lakes area. Earning Free Jewellery could never be so much fun! 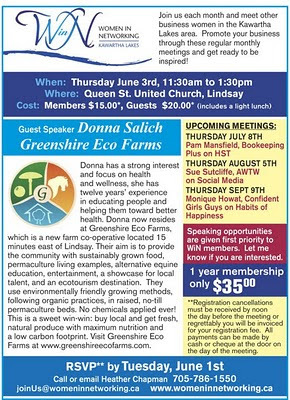 This Thursday is our June WiN meeting, Donna Salich of Greenshire Eco Farms will be our guest speaker - full details below. I am hoping to get the room on the 3rd floor of the church annex again as it was such a nice room. I will confirm as soon as I find out. Either way we will be at the Queen St. United Church at 11:30 am next week. Please note: The July and September meetings will be held on the second Thursday of the month due to holidays. Dates are posted on the attached flyer. Please let me know as soon as possible if you will be attending. I look forward to seeing everyone this Thursday. Hello Everyone! 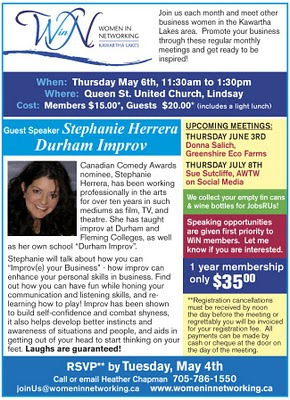 Next Thursday, May 6th is our next WiN meeting and I'm excited to say that Stephanie Herrera of Durham Improv will be our guest speaker. Click on the flyer below for full details. Please note: There will be a funeral taking place on Thursday in our scheduled meeting area so we will now be meeting in the Church annex, 3rd floor (Red brick building accross the parking lot on Lindsay Street). Please park in the church parking lot down by the river to allow room for the funeral procession into the church. No, it's not an April Fools prank! Believe it or not April is next week and we will be meeting Thursday, April 1st! Hello Ladies! Here is your monthly reminder about next weeks meeting. 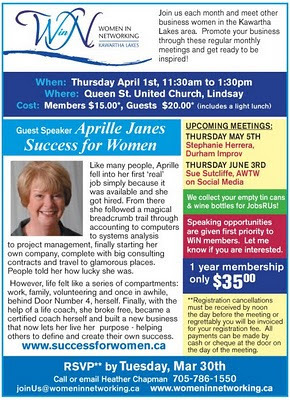 Our guest speaker is Aprille Janes of Success for Women and believe me, you don't want to miss this! Please see the flyer below for full details and let me know if you will be attending. Please do pass the flyer around to anyone you think might be interested. 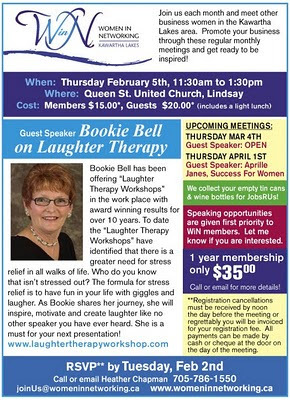 We will be meeting this Thursday, March 4th at the Queen Street United Church from 11:30am to 1:30pm. 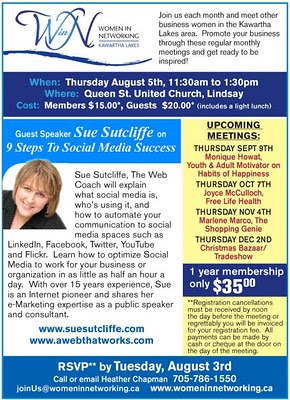 Please let me know if you would like to attend by sending me an email at joinus@womeninnetworking.ca or by calling 705-786-1550. 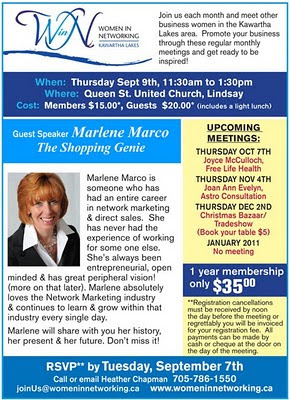 The cost for members is $15 and $20 for guests (includes a light lunch) which can be paid by cash or cheque at the door. Please bring a small door prize if you can along with your marketing materials and your enthusiasm! I look forward to seeing everyone on Thursday. I hope everyone had a wonderful Christmas holiday and a very happy New Year! Just a reminder that we will not be meeting this month. Our regular monthly meetings will resume as of Thursday, February 4th. Wishing you a great start to 2010 and I look forward to seeing everyone in February. I am very happy to report that from our December meeting, Silver Connections draw and past 50/50 draws we were able to donate $150 to the Kawartha Lakes Food Source along with some non perishable food items. 2009 was awesome and I'm so looking forward to 2010! Cheers!